Shortly after the death of his father, Jax Teller decides to follow in his dad’s footsteps, and attempt to become a member of the Sons of Anarchy motorcycle club. The ride begins here with the never-before-seen, fully authorized story of Jax Teller’s first year as a SAMCRO prospect. Jax has always had one dream: to follow the family legacy and join the Sons of Anarchy. But at eighteen, still reeling from his father’s death and just starting out with the motorcycle club his father co-founded, Jax is about to discover just how hard the life of an outlaw can be. Writer Ollie Masters (Snow Blind, The Kitchen) and artists Luca Pizzari (Secret Wars Journal, Amazing Spider-Man), Eoin Marron (James Bond: The Body), and Lucas Werneck (Power Rangers: Aftershock) roll out ten years before Season 1 of Kurt Sutter’s critically acclaimed television series. 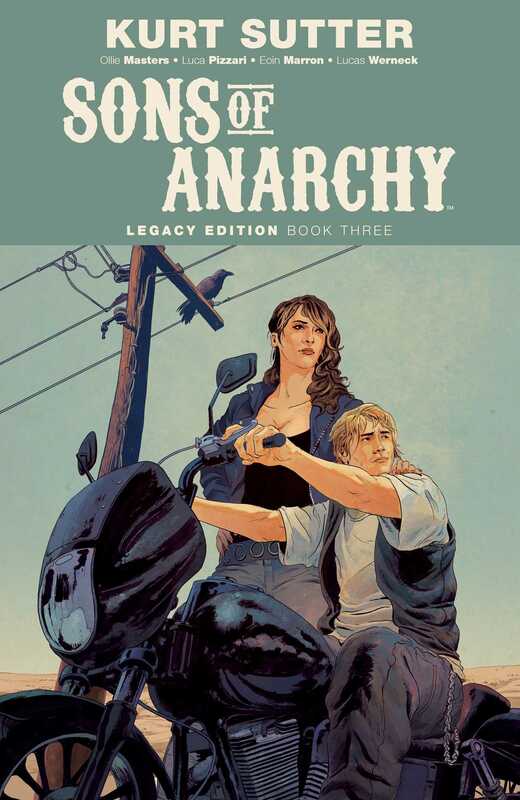 Sons Of Anarchy: Legacy Edition Book Three collects Sons Of Anarchy Redwood Original #1-12, originally collected in Sons Of Anarchy Redwood Original Volumes 1-3. Legacy Editions collect every issue of the most popular BOOM! Studios series in chronological order and in a newly designed, value priced format for the very first time.